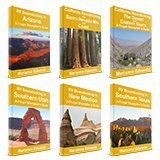 On a long trip you'll want plenty of variety in your travel activities. What Will You Do With All That Time On The Road? Are you afraid the initial anticipation and excitement will give way to repetition and boredom? Or that you'll be tempted to throw the budget out the window and spend money to keep from being bored? Some Couples Worry That So Much Time Together Could Actually Hurt Their Relationship! To escape ... get away from the work, routine, stress, habits, emotions, and sometimes even from the people we associate with home. Each of us will prioritize these differently. For couples, keeping the travel activities varied, should help to satisfy the needs and priorities of both parties. We also try to vary the types of places we visit. If we've spent a week in an isolated location, we're usually ready to find a camping area where we can meet and socialize with other campers, or a town where we can spend a day shopping, visit a cultural or historical attraction, or occasionally take in a movie. Entertainment on the road doesn't have to equal spending money. 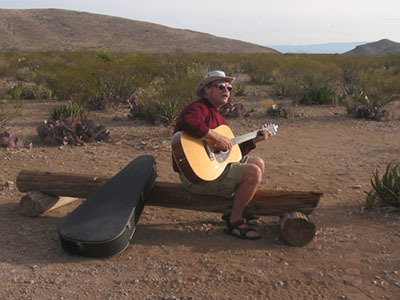 Some of our favorite pastimes when traveling are free and require little or no special equipment. If you're a person who needs the flashing lights and big city to be entertained, you shouldn't even be on this website. 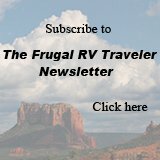 For the rest of us, here's a list of travel activities (most of them free or low cost) that should keep even the longest trip from getting stale. Free Travel Activities: The Excitement of "New"
Bicycle, go fishing, bird watching, and if you have the equipment, canoe or kayak. Look for an inflatable 2-person kayak or canoe that's light and easily stored. 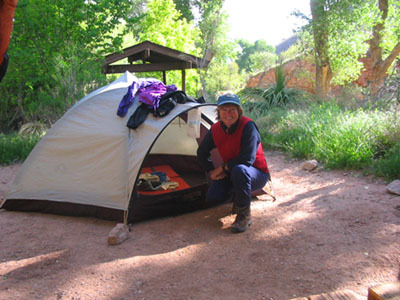 Take a backpacking trip and go tenting. After all, there are some places the RV can't take you. At a State or National Park, attend the free ranger-led walks and campfire nights. Carry a guidebook and learn the names of as many local plants and animals as you can. Make love ... outdoors, with a scenic view. Gather seashells, try rock hounding. Socialize. If you're open to it, meeting new people is easier on the road than at home. Travelers are all in the same boat. Away from family and friends, most want occasional company. Sharing meals, happy hour, campfires, or hiking with newfound friends could all be part of the experience. Visit free museums and historical sites. Take in the exhibits, slide shows and movies at the area visitor centers. Visit churches, town halls, old hotels, and other buildings of architectural interest. Browse the shops, artists studios, historical buildings, thrift stores, used book stores, open air markets and flea markets. Volunteer. Search out opportunities such as Habitat For Humanity, The Red Cross, local food banks, forest or BLM services and offer a few days of your time. Join SOWERS (Servants On Wheels) a non-denominational Christian RV volunteer group. Make use of the municipal parks and libraries. Stop at wineries for free tours and tastings. Attend town festivals. You can plan your trip to include these, or just luck into them. Examples of some of the best free festivals we've lucked into on our travels include: Fiesta San Antonio (10 days with 100 free events every April) and July 4th, Independence Day celebrations in Duluth, MN where we caught a free concert by one of our favorite rock and rollers – George Thorogood! We've also discovered some obscure but really fun events such as the Mike The Headless Chicken Festival held every May in Fruita, CO. 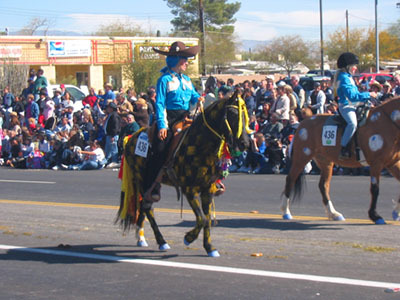 In February, Tucson's "La Fiesta de los Vaqueros" has the largest non-motorized parade in the country. By the way, for the frugal RVer, an added bonus to small town festivals is that the local campgrounds can't accommodate all the visitors. Any rules prohibiting free camping in public parks, parking areas, or along the streets are usually thrown out for the weekend. Watch the sunset or sunrise, or a thunderstorm. Sunbathe, sit by a campfire, lie on a blanket under the stars, count your blessings, listen to the wind in the trees, the birds singing, or watch the squirrels or lizards scamper by. Read. Bring the books you've intended to read, but haven't had time for. Donate them to a small town library as you finish them. Listen to music or radio. We tune into NPR for Prairie Home Companion regularly for 2 hours of free entertainment on the road. Hobbies. Many are easily transported. Do crafts such as knitting or carving. Create your own unique souvenirs and gifts to bring back. I like to dabble with drawing and water color paints. Solve puzzles, crosswords, or sudoku …good for the mind. Play cards or board (not bored) games. And last and also definitely least on our list of priorities, there's always TV, dvds or the computer for those who need a technology fix. We watch local stations on our laptop computer. That's right: no TV or Internet required. Often we just want to get away from an aspect of our lives we aren't happy with. Get active. A long trip can be the perfect time to start or renew an exercise program. A weight program can be transferred to a workout with heavy rubber bands since you won't want to carry extra weights in your RV. Break bad habits. Getting away from your normal triggers can be the perfect opportunity to quit smoking, eat healthier, or change other habits. Learn something. Take up a new hobby, learn to meditate or any number of things you never seem to find the time for at home. Of course, you'll need to pay the entry fees to visit the local attractions. After all, did you come all this way NOT to see them? Watch for tourist traps. Usually entry fees to the most noteworthy area attractions aren't over-priced but avoid the obvious tourist traps, often nearby the star attractions. Avoid the added expenses. The helicopter view, the movie of your experience. Instead of the guided tour, opt for the self-guiding booklet or audio guide that allows you to go at your own pace and repeat what you didn't hear or understand. Don't buy souvenirs. You know they'll only take up space in the RV and later gather dust at home. Your memories, photos and stories are the best souvenirs. If you can't resist, buy a postcard suitable for framing. Buy park passes. In our opinion all the natural parks and historic sites are worth the entry fee. Consider purchasing the annual pass to save money. Avoid peak times. Many attractions offer discounted fees on weekdays or during off-season months. Look for Coupons at visitor information centers. Often there are coupons printed on brochures. Ask about special promotions, discounts or combination passes for visiting more than one attraction. The following suggested travel activities do have a cost, but minimal, so consider adding them from time to time. Take the scenic drives marked on your roadmap. Go on a casino cruise. Enjoy the cheap meal and the views. No one will even notice that you didn't gamble. Attend a local dance, church supper or happy hour at a bar. Especially in a small town, take the opportunity to socialize and meet the locals. They're usually very interested in hearing about your traveling lifestyle and are the best authority on what you should see and do in their area. Even if you don't meet anyone, it's a night out. Attend minor league baseball games. Minor Trips, an annual publication ($10.00) is geared toward travelers and helps you find minor league games and times across USA and Canada. Early in the season, tickets to major sports events can be cheap. When we were in San Antonio, tickets to a Spurs game were only $5.00. Whether at home or on the road, alone or as a couple, staying active is a key to feeling young and alive. For the full-timer or long-term RVer keeping your travel activities varied will help to ensure your continued enjoyment of traveling. Life IS a trip! Enjoy it!